I gave Doi recipe before which is very handy but not traditional way. So I am sharing this recipe to make Bangladeshi Tradition Yogurt / Misti Doi / দই(দধি) in traditional way. If you don’t have or don’t want to go the hassle of boiling milk, you can use evaporated milk. Hope you will make and enjoy with your loved one in this summer. In a pan add sugar for caramel and heat it. Cook it till it becomes golden caramel (do nt over burn it, then it will bitter taste). Add milk in caramel and boil it till it becomes half in amount. Don’t forget to stir occasionally and add sugar. When sugar dissolves, remove it from heat. Let it cool down till it becomes lukewarm, mix yogurt with it (make sure yogurt mix well with milk, you can use hand beater/ stick mixer/ blender or fork. Pour the milk in bowl /pot where you want to set yogurt and keep it warm place [such as beside your stove, lowest temperature in oven or you can even steam to make steam yogurt (bhapa doi/ভাপা দই)] for 5-6 hours. Please don’t move the pot in this time. 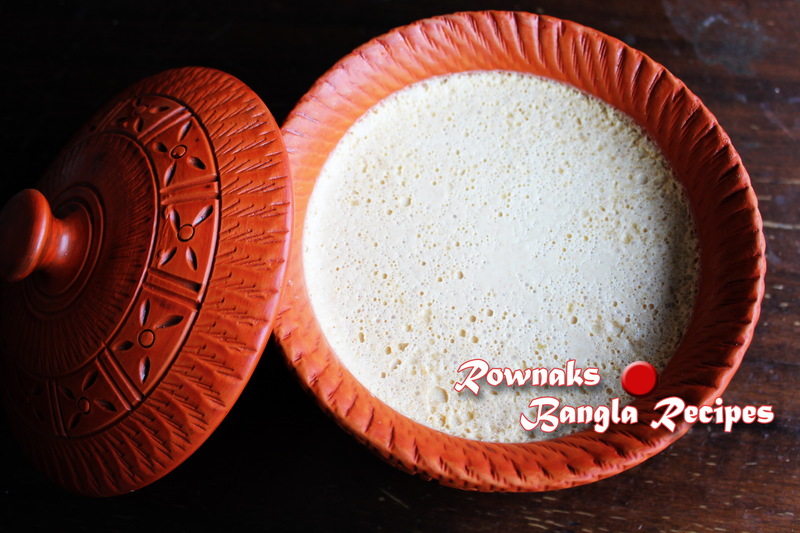 After 5-6 hours put yogurt in refrigerator and enjoy yummy Traditional Bangladeshi Sweet Yogurt. For plain yogurt just omit sugar and caramel. Don’t move the yogurt when you are putting to set yogurt. How many cans of evaporated milk should we use? Thank you! You need to take half liter evoporated milk which will be about 1 and half can s. but if you want to use 2 cans , just add 1 tablespoon more yogurt. Thanks. Really lovely to about you. I love food and want your help. I am from Bangladesh, wish to have your contact. I have tried. sucess but not so much. I have to try again. You have not mentioned what the problem with your yogurt. Looking forward to hear from you to solve the problem.